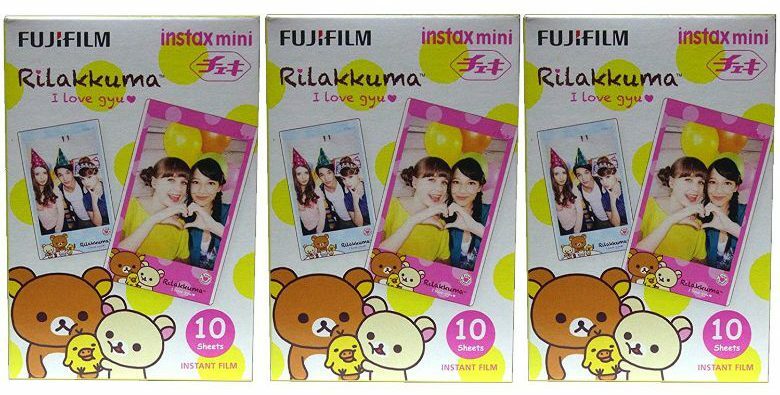 Home » Films » Where to Buy RiLakkuma Fujifilm Instax Mini Film? The character RiLakkuma is very popular in Japan and many other countries in the world. The name is derived from the combination of the words relax and bear in Japanese. The character, presented as a soft teddy-bear like toy, is a creation of the Japanese stationery company San-x. Rilakkuma first appeared in picture books but is now more famous as a soft-toy character. One of the latest appearances of Rilakkuma is on the borders of Fujifilm Instax Mini films along with lady friend Korilakkuma (loosely translated as ‘mysterious white bear’) and a yellow chick named Kiiroitori (‘yellow bird’ in Japanese). Thus, in a way, RiLakkuma manages to ‘photobomb’ its fans’ instant portraits – albeit with their consent. 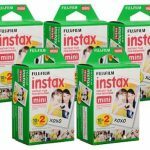 Amazon online merchant ‘nextoyou’ offers 1 pack of Fujifilm Instax Film good for ten exposures in the fun Rilakkuma edition. The film’s borders are adorned with white dots on either a pink or blue background, and on the lower border sits Rilakkuma with friends Korilakkuma and Kiiroitori. The film is compatible with instax mini 7, 7s, 8, 25, 50, 55 Polaroid 300, Polaroid mio, Diana instant +back cameras. 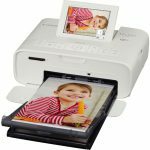 Image size (printed area) is 62 X 46mm. Gift wrap as well as next day delivery is available. 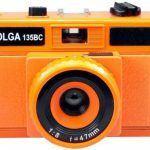 Amazon merchant ‘JapanWorldService’ offers three packs of Fujifilm Instax Films each good for ten exposures. Each pack is available in three fun designs featuring popular cartoon characters: Rilakkuma, Hello Kitty and Little Twin Stars. The characters show up on the film’s borders. 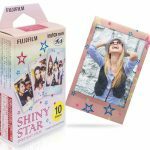 These films are compatible with all Fujifilm Instax Cameras and are of the 86mm x 54mm size. 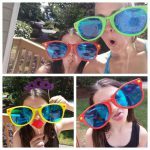 This set produces 30 fun prints. Amazon merchant ‘AkibaJapan’ has a special bundle for diehard Rilakkuma fans: a set containing 3 packs of Fuji Instax Mini Instant Films each good for 10 exposure in Rilakkuma design. 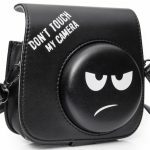 The film image size is 2.13″ x 3.4″ and it is compatible with Instax mini 7, 7s, 8, 25, 50, 55 Polaroid 300, Polaroid mio, Diana instant +back cameras. Options include gift wrapping and next day delivery. Due to their popularity, there are many vendors offering Fuji Instax instant films in many fun designs based on cartoon characters. Currently available are instant films featuring Rilakkuma, Little Twin Stars and Hello Kitty. You can choose to buy these films in individual packs of ten exposures each, or in bundles. You may choose from film bundles containing only the Rilakkuma character, or bundles containing three different characters. Choose the one you like best!